On 12 March 2013, it was our turn to host the latest Online Manager’s Forum, an informal gathering of people working in London museums and other cultural organisations, which meets every 2-3 months or so, to pool knowledge and ideas on cultural digital services. The topic for this session was finding out what museum visitors really want from mobile devices and mobile digital services based on their own words. To do this, the session reviewed and discussed surveys of museum visitors conducted in a number of London museums and what people visiting in person said about their own and museum mobile devices, what they might want from them in a museum and their thoughts on content and services that are, or could be, delivered to those devices. 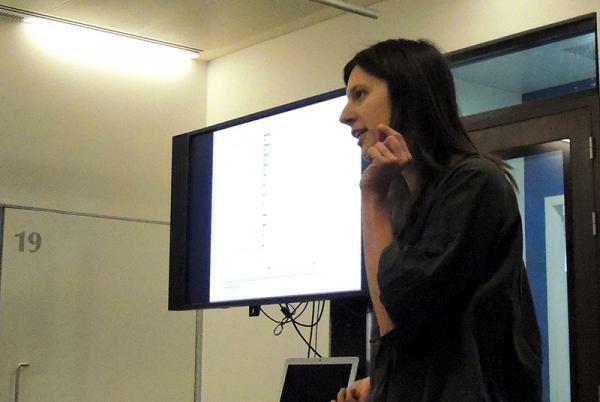 The session included summaries of the findings of two visitor surveys on the use of mobile. The first was conducted at the V&A. This is complete and is now publically available (link below or click on the image). The second was a separate joint study conducted at the National Gallery, Tate and Imperial War Museum. This is not yet published, having only recently been completed, but some themes from it are included below. Introduction – why should we be considering mobile? 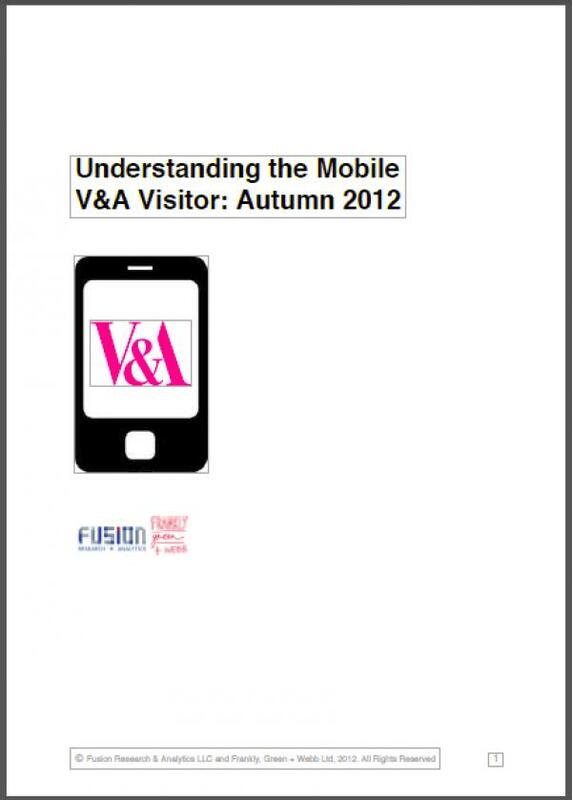 This survey conducted in autumn 2012, was commissioned jointly by the Digital Media and Learning departments and was based on interviews with visitors to V&A galleries. It has lots of fascinating details about visitors’ uptake of personally-owned mobile devices, the way they use them in different contexts and their attitudes to digital content and services in the Museum such as WiFi. Here’s a random example of some occasionally surprising results that challenge preconceptions of what ‘typical’ museum visitors actually do with mobile. There are lots more in the report itself. Almost two thirds of visitors to the V&A own a smartphone and carry it with them in daily life and on their visit to the Museum. This percentage is likely to continue to grow rapidly in the next few years and represents a significant opportunity for the Museum to engage with its visitors. In the short term smartphones present a significant opportunity to connect with younger audiences. This will need to be considered when determining the type of experiences and content created. In the medium term ownership is likely to extend across the age range. However, it will continue to be important to consider the different ways in which various age groups think about and use their devices. The majority of smartphone owners visiting the V&A are already using their phones to enhance their cultural visits. There is an opportunity to leverage these existing behaviours to meet the Museum’s mission. Building on and shaping their existing activities – photography for example – offers the most immediate opportunity, but supporting their searches for information is also a rich area for development right now. 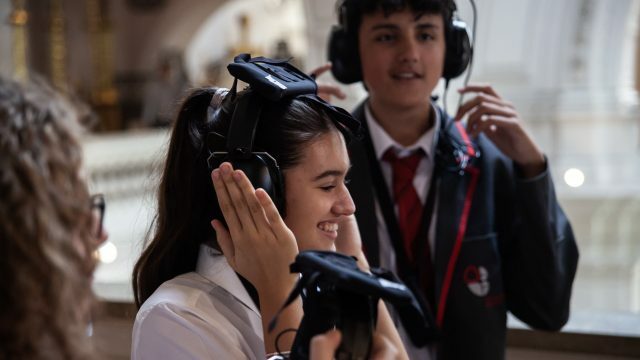 More than a third of V&A visitors own a tablet device and as a result they also represent a significant and growing opportunity for the V&A to connect with its audience. A smaller proportion of visitors bring their tablets to the museum so, in the short to medium term that opportunity is associated with content and/or experiences to be consumed at home rather than on site. Given that there is a correlation between smartphone ownership and tablet ownership there is also an opportunity to cross-market – using tablet-based experiences to encourage visits to the museum and promote smartphone based experiences whilst visiting. The V&A audience are enthusiastic about the free WiFi service provided by the Museum and the idea of accessing museum content. However, low awareness is having a significant impact on the proportion of visitors who are using the system. 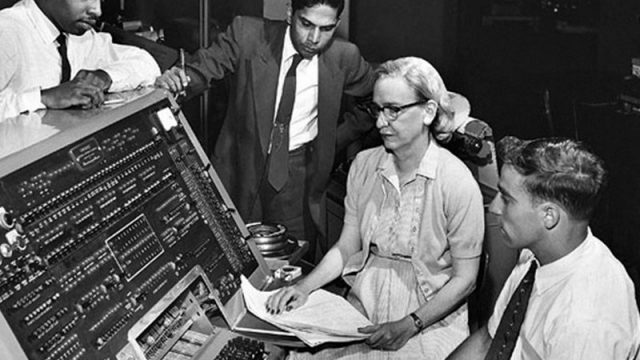 Communicating both the availability of the system and its benefits will be crucial to success. Users find the V&A’s WiFi service easy to access but are less positive about the strength of connection. Given appropriate promotion and some improvements to the robustness of the connectivity one could expect significant levels of take-up. Today’s cost of international roaming mobile access (i.e. data) means that access to free WiFi is absolutely crucial in reaching foreign visitors – who comprised just under half of all visitors according to the 2011-2012 annual visitor survey – it is also an important factor in supporting the domestic audiences as well many of whom have limited data in their payplans. 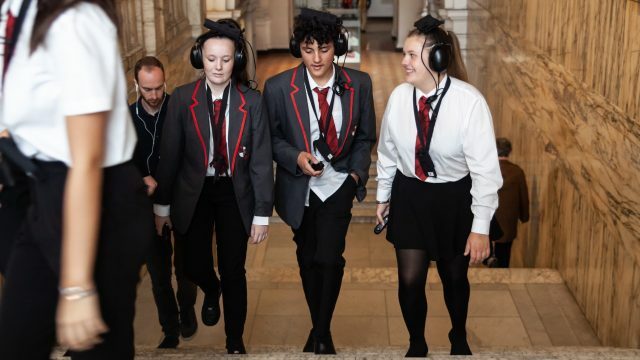 The majority of V&A visitors – and particularly those who are younger and reside in the UK – do not typically use ‘museum audioguides’. These younger visitors express a preference for using their own device, citing most often its convenience and familiarity. However, given that they are not traditional tour takers, the nature of the experiences and/or content they would find appealing is less clear. Translating their enthusiasm into use will require not only an appropriate offer but also the removal or amelioration of any practical barriers such as lack of headphones, battery charging, etc. If the Museum wants to ‘convert’ the traditional audio tour takers amongst its audience and encourage them to use their own devices it will be important to provide a service that is very easy to use, clearly be a Museum service (with the credibility that conveys), and the V&A will need to give some consideration to the more practical issues such as opportunities for visitors to charge their phones, and offering headphones to those who may not have them. Visitors’ expectations for mobile are focussed around ease of access, content that is tailored to their interests and needs and an offer that at least covers the ‘basics’ – hours, prices, what’s on etc. This highlights the need to design experiences from a user needs and motivations perspective rather than a technology perspective. The most immediate opportunities tap into what visitors are already doing: taking pictures and searching to discover information. Respondents were also positive about the idea of music relating to a period or place. Other opportunities – creative activities such as drawing, or games – would be more appropriate as part of bigger strategy to connect with specific audiences. Tijana Tasich from Tate and Charlotte Sexton from the National Gallery ran through initial findings of a user survey of 2,734 people conducted by Fluent Interaction across Tate, the National Gallery and IWM. The full data is not yet available to publish, but they discussed some interesting themes that were emerging. Comparing with the V&A survey above there were some similarities and some quite different results. In addition, running a joint survey across three large cultural venues at the same time revealed other interesting comparisons. For example, there were differing views from audiences about how appropriate it was to use mobile devices within a museum. Most visitors expected it, although the number that did varied significantly between venues. Some visitors were actually strongly opposed to it on grounds that it detracted from the experience of the objects themselves. The tension between users differing needs and attitudes was an issue affecting most people in their organisations’ public spaces. For example how do you create a mobile-centred active space for some visitors in an environment when other visitors want tranquillity? This issue can be seen effectively as segmentation by motivation. Some service solutions discussed included separating these differing experiences physically, such as by having different areas with different experiences. Another approach was to separate by time, so that different visitor behaviour is encouraged or allowed at different publicised times. This is the model used in cinemas for ‘over18 only’ or ‘parents with babies’ sessions. 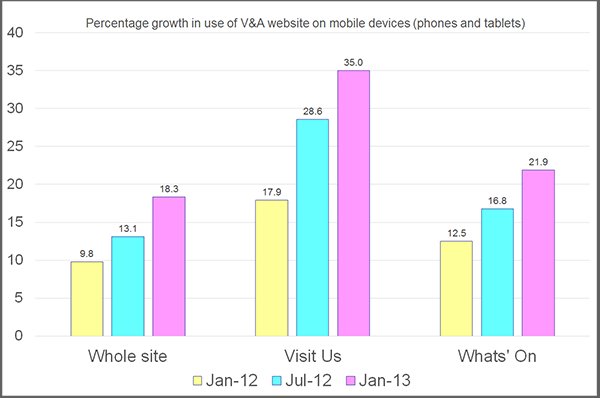 Clearly, mobile is changing the way we will have to think about visitor experience management. New etiquettes will emerge about how we use mobile in shared public spaces. Digital service development staff will need to work closely with visitor services to establish supporting staff processes to help visitors know all the new things they can do with mobile and the ‘be nice’ terms that are reasonable to others. Similarly there were differences in the stated attitudes of those surveyed depending on the activity in question. For example people generally said they were less likely to make donation on a mobile compared to buying tickets on a mobile, citing uncertainty about how secure visitors thought it would be to make a financial transaction via mobile. The responses indicated that an individual’s motivation for visiting and the context of the specific visit may be more important than demographic breakdown. This was discussed as being a complementary factor to consider with demographics. Understanding these factors are clearly vital to help develop relevant services. Any one individual visit any single venue for more than one reason. For example they may be visiting alone and want to immerse themselves in the art or ambience of a venue, or they may be part of a group visiting for a predominantly social visit and so on. Charlotte made the point that even within a single visit the context will change depending on the immediate need in the moment. Another recurring theme in the findings of both the two surveys was that the growing use of mobile is occurring in all the venues surveyed and will require changes in business processes. Tijana championed the user and that they rightly will expect all parts of the Tate digital presence to be the same standard. The responses from the survey shows that users expect the same resources from mobile as they do from desktop and that this implied that one-off apps and reduced-content separate mobile websites are no longer suited to users’ needs. Both Tate and the National Gallery, are working with colleagues to create unified digital experiences on web and mobile web. Although the data of this survey is not yet ready for publishing, this brief review showed some interesting quite markedly different results within seemingly similar organisations. It was suggested that although the survey findings will be of use to practitioners in other museums, they should be used with care when being used by other organisations. The local context should be considered in interpreting them, such as the type of collections they hold, the established patterns of user-activity within them and so on. Having said that some visitor needs are generic and comparable in most organisations such as wayfinding, finding out information about facilities or looking up object information as required. Findings about user needs in these functional contexts may be more transferable. The research at Tate, the National gallery and Imperial War Museum will be published soon (Spring 2013) and presented later in the year. This was a great session with lots of ideas, takeaways and examples to investigate. Digital Content Delivery Manager at the V&A. Information scientist at work and hacky maker of strange things out of it. Yea! Congratulations! This is so exciting to read, and thanks for sharing the results of your attentive work! As an early facilitator, in my area, of mobile technology access to the cultural environment, this study puts a smile on my face! I will be sharing it as a go to reference of consideration in the next D&D conversations with colleagues in multiple disciplines! This survey was fairly open-ended. It didn’t have specific questions about access technologies, although if visitors in the Museum had been at the time, this would have been interesting. Thanks. Lots of museum and other cultural organisations do research. We believe we all learn more, and faster, if we share the findings, so we are trying to get them out as fast as we can, to allow other professionals to have insights and feed back into the collective knowledge. And of course, you’re right – asking users is a good thing! Thank you all – finally a survey about what visitors like and want. We’re waiting for the results of the other venues ! Great article. Mobile still is fairly premature in cultural institutions, especially in Germany.